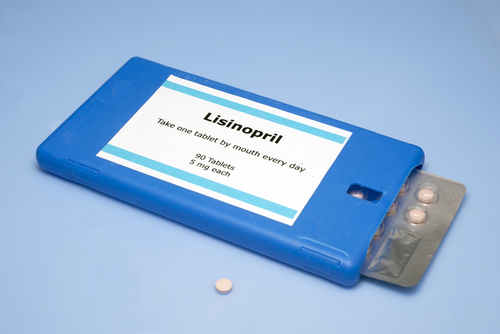 Lisinopril is an oral formulation prescribed for treating patients with acute hypertension, congestive heart failure, and heart attacks. Chemically belonging to the class of angiotensin converting enzyme (ACE) inhibitors, it is being studied as a potential treatment for people with multiple sclerosis (MS), an initiative undertaken by Transparency Life Sciences (TLS) LLC. The program aims to determine whether the drug’s observed immunomodulatory properties make it an adjunctive therapy for MS. The main mode of action for ACE inhibitors is relaxing blood vessels so as to reduce blood pressure. However, studies with mouse models have shown immunomodulatory properties as well. Angiotensin is a hormone with receptors bound to most blood vessels in the body, whose overactivity causes hypertension. Lisinopril blocks the precursor enzyme (ACE) of angiotensin to prevent its activation, lowering blood pressure. Researchers have observed that brain plaques, taken from deceased MS patients, had high levels of the angiotensin receptor and the angiotensin-producing enzyme blocked by lisinopril. Further studies in mice, with induced brain lesions similar to those in MS patients, found that lisinopril at doses similar to those prescribed for blood pressure patients either prevented the mice from developing the paralysis that marks disease progression or, if already with full-blown symptoms, reversed paralysis and improved mobility. Moreover, treatment with the drug triggered the proliferation of regulatory T-cells that reduce autoimmune attacks by targeting faulty immune cells that harm cells and tissues. These observations, along with the fact that the drug already has an approved safety and toxicity profile, and is much lower priced than existing MS drugs, have paved the way for further clinical studies of lisinopril as an adjunct to existing MS therapies and medications. These studies are being funded by the National Center for Advancing Translational Sciences (NCATS) of the U.S. National Institutes of Health (NIH). An Investigational New Drug (IND) application with the U.S. Food and Drug Administration (FDA) was cleared in December 2012. Currently, an endpoint calibration Phase 2 study of lisinopril in multiple sclerosis is underway, and currently recruiting participants. This study (NCT02369926) seeks to calibrate the Multiple Sclerosis Functional Composite (MSFC) score for home use of the drug. what if you are on an ms medication such as aubagio which is contraindicated for lisinopril? Are there any ms drugs that are compatable with lisinopril?